Check out DAC09 on Amazon. 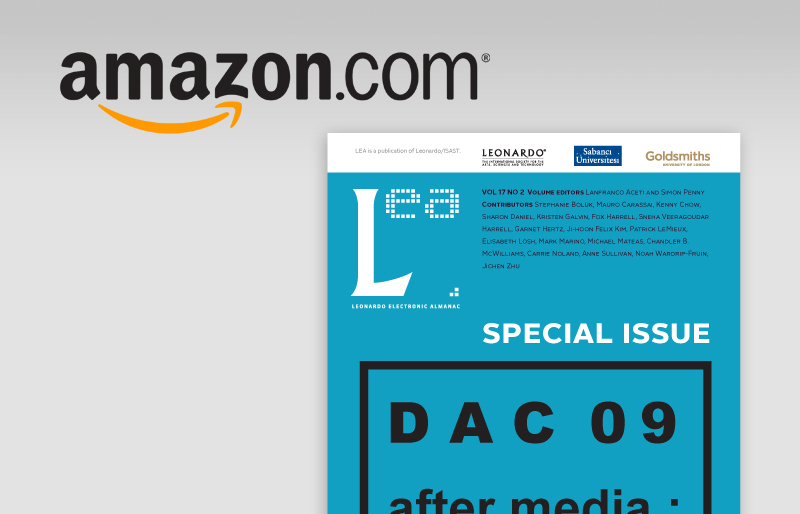 Leonardo Electronic Almanac presents its first special issue on Amazon. This special issue is titled DAC09: After Media: Embodiment and Context and presents a series of research articles on contemporary interdisciplinary research in digital art culture and media part of the DAC09 conference. Special issue volume editors are Lanfranco Aceti and Simon Penny; contributors: Stephanie Boluk, Mauro Carassai, Kenny Chow, Sharon Daniel, Kristen Galvin, D. Fox Harrell, Sneha Veeragoudar Harrell, Garnet Hertz, Ji-hoon Felix Kim, Patrick LeMieux, Elisabeth Losh, Mark Marino, Michael Mateas, Chandler B. McWilliams, Carrie Noland, Anne Sullivan, Noah Wardrip-Fruin, Jichen Zhu; Deniz Cem Onduygu (Art Director) and Zeynep Ozel (Designer).